You’d never guess which future is more appealing. The past year has been an interesting and diverse one for fans of cinematic science fiction. We’ve had Christopher Nolan’s ambitious, if flawed, Interstellar, and Alex Garland’s fascinating Ex Machina. Right at the moment, cinemas are sporting two further major releases that do what all good science fiction does: reflect the concerns of the present in visions of the future. 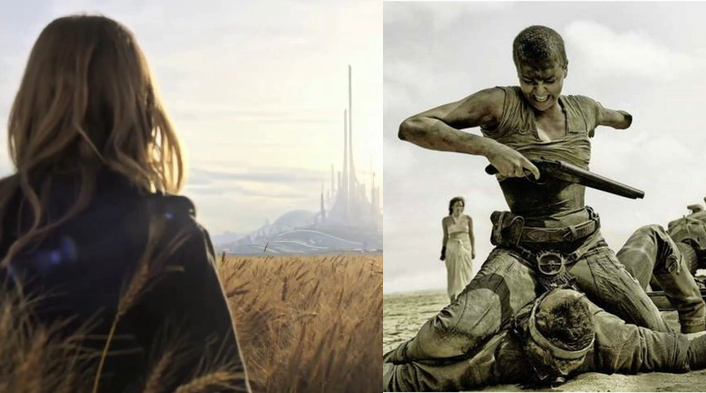 George Miller’s Mad Max: Fury Road and Brad Bird’s Tomorrowland are both visually stunning, but their similarities go deeper than that. Both films depict an alternate present instead of a distant future, albeit both warning in their own way of how our own present could go. In doing so, they become fables, trying to make their points symbolically, with characters who represent much more than the journeys that they go on. A central theme of both films is the need to avoid giving up, to retain optimism and humanity in the face of cynicism and despair. But for all of the similarities, there are multiple differences too. Most glaring is their storytelling success—Fury Road is good enough that it’s hard to pick holes without coming across as petty, whereas Tomorrowland struggles to avoid being dragged back down into the summer blockbuster mire. Taking a look at the differences between them might help to illustrate this. It’s my hope that the below won’t read like a rant, but it probably will. So, spoilers ahoy!